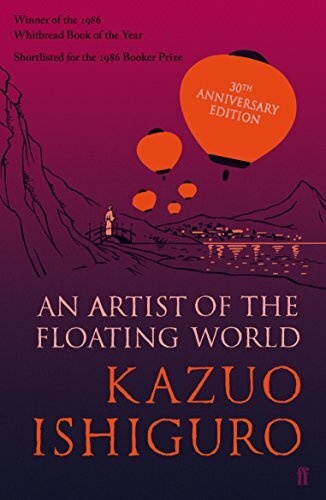 This week’s first paragraph is from An Artist of the Floating World by Kazuo Ishiguro, who has been awarded this year’s Nobel Prize for Literature. If on a sunny day you climb the steep path leading from the little wooden bridge still referred to around here as ‘the Bridge of Hesitation’ you will not have to walk far before the roof of my house becomes visible between the tops of two gingko trees. Even if it did not occupy such a commanding position on the hill, the house would still stand out from all others nearby, so that as you come up the path, you may find yourself wondering what sort of wealthy man owns it. There are some books that draw me in right from the beginning – and this is one of them. I’m hoping it lives up to its promise. I like the way Ishiguro paints a picture setting the scene in my mind as though I’m standing there looking at the view. what beautiful writing – I would so read on. The writing just begs you to keep reading. I love the writing so I’d definitely read more. A very descriptive opening. Hope it’s an enjoyable read. Thanks for visiting my blog. This one does sound interesting, Margaret! And that writing style really draws one in. I also give credit to the translator, who makes it all flow really effectively. I would definitely continue reading it, in fact I will read it – sometime. Thanks. I’d have to read more and then decide whether to continue or not. I agree with your other comments – beautiful writing that makes me want to rush out and get this book now! Remains of the Day is one of my favourite books but oddly, I’ve never read any of his other works. I was very pleased when he won the Nobel Prize.